One of the things that sets the SBG Sword Store apart from other sword vendors is that we EXCLUSIVELY sell swords that are fully functional. While they may look great, they are NOT display swords. Each one is hand made from carbon steels (usually 1060 or 1075 carbon steel, high speed T10 tool steel, 9260 or 5160 spring steel and advanced steels such as L6, S7 shock steel, etc) - we do not sell stainless steel wallhangers..
Each one is also fully sharpened, so are unsuitable for sparring practice..
ALL are full tang, and all are tempered to flex and cut the kind of targets that they were historically designed for. The first reason is that it is simply so much COOLER to own or display a fully functional sword that could literally be taken back to a historical battlefield and hold up in actual combat. Most people when they first see a sword on display somewhere ask "it is a real sword?" and the answer, if most people are honest, is "no" - and the conversation stops dead. With these swords, you can proudly answer "yes" - and there really is nothing more impressive than the aura a real sword has on display when compared to something that is merely a decorative ornament. The second reason is that many of our customers like to on occasion try their hand at cutting various targets such as water filled milk jugs or P.E.T. bottles, rolled and soaked newspapers, bamboo, tatami mats, etc. This is hugely satisfying and very addictive (almost as addictive as actually collecting the swords in the first place). Please note though - if you this, it is YOUR responsibility to do it in a safe and careful manner. Swords are not toys. Respect them as you would any other deadly weapon. We do NOT condone the use of swords on animals or human beings. In our day and age, there are much more effective and deadly weapons available than swords. Using swords to defend yourself may sometimes be unavoidable, but it should always be a last resort. If a sword is used in defense, it damages the reputation of responsible collectors who simply admire the beauty of a functional blade and the gruesome damage inflicted may be hard to justify in court. Just don't do it. If you need to defend yourself, use a more appropriate weapon to our day and age such as a gun, knife, baseball bat, etc. Stainless steel is a common but inappropriate steel for swords. It is simply too hard to temper properly and often too brittle. NONE of the swords we sell are made from stainless steel and we have a no exceptions, no compromises polciy on selling decorative wallhangers. Below are the common sword steels our swords are made from. 1060 Carbon Steel: This high carbon steel is a good compromise between toughness and hardness and makes for a great 'beater' style sword. Carbon content is approx 0.6%. 9260 Spring Steel: When monotempered (see below) 9260 spring steel is slightly more durable than 1060, and can flex further without taking a set. Carbon content is also approx 0.6%. When diferentially hardened. 5160 Spring Steel: Another spring steel, it is very similar to 9260 and has the same carbon content, 0.60%. It is great for medieval swords. 1075 Carbon steel: This is a great choice for medieval swords, allowing greater edge retention than 1060 but still very durable and able to flex and return true when monotempered. Carbon content is 0.75%. T10 Tool Steel: In many ways, I have found this to be the ideal steel for modern functional replicas of Katana. When differentially hardened (see below) the hamon is very distinctive and easy to see, and it is surpringly durable overall for a differentially hardened blade. Carbon content is close to 1% - if monotempered it is just a little too close to the brittle side, but is perfect for Japanese swords when clayed and differentially hardened. There are several other steel types our swords are made from, including exotic steels like L6, S7, O1 and many more. For more information on sword steels, you can refer to this article on the main site "Sword Steels 101" (link opens in a new window). There are two main techniques of hardening and tempering a sword depending on its intended use and style. The majority of our swords are monotempered. That is to say, they are tempered to the same hardness all the way through (through hardening). This allows them to bend and flex and return to true, and makes them extremely durable. Many of our Japanese swords are differentially hardened. This means that the spine is softer than the edge (usually HRC of 60 at the edge and 40 at the spine). This allows the edge to be very sharp and hard, so that it cuts easier against standard targets. If it was the same hardness all the way through, it may break or chip badly. These swords cut better on targets such as bamboo, tatami mats, etc (the Japanese sword was specialized to cut human flesh and bone) but the downside is that they may take a set (i.e. a permanent bend) or chip if cutting very hard targets. In a nutshell, which type you should select depends upon personal preference. If you want a traditional Japanese sword with great cutting ability for Tameshigiri (test cutting) then a differentially hardened katana with a real hamon is your best choice. If you want a sword that can handle some 'abuse', then you should pick a monotempered blade. For more information on our swords, policies, etc - please refer to our FAQ page. If you cannot find the answer you are looking for there, do not hesitate to contact us. We really enjoy talking to fellow sword enthusiasts and respond to EVERY message, so we look forward to hearing from you. 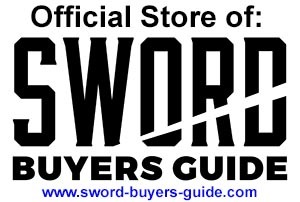 Hope you enjoy our store - we only stock swords that we stand behind 100% and would be proud to have in our own collection - many of which are exclusive to SBG and cannot be found anywhere else.